Paul Giovanni's semi-original Sherlock Holmes play is based largely on Conan Doyle's The Sign of Four. "The dreadful case of the blood crucifer occurred in London in 1887 and formed one of the most painful and alarming episodes in my long association with Mr. Sherlock Holmes. We were young, and most of our career lay before us. If some other hand be tempted to present it to the public in narrative form, it will, I hope, become apparent why I considered it best to leave unrendered, the heart of this appalling story. It begun, some thirty years before, in India, during the Great Mutiny of the Red Fort of Agra..."
Thus, playwright Paul Giovanni has stepped into the illustrious shoes of Sir Arthur Conan Doyle, and presented an ever-increasing audience of Holmesian admirers with a new spine-chiller. 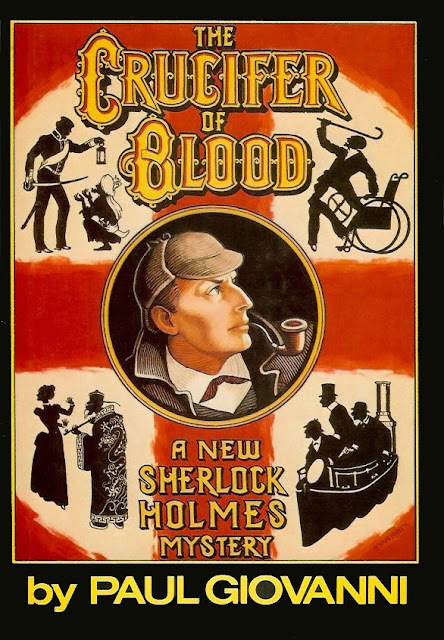 From The Red Fort's hundred gates to an opium den in London's Limshouse district, Holmes' astounding deductive powers unravel the mystery of a bloody curse. Nefarious actions and delicious thrills abound. 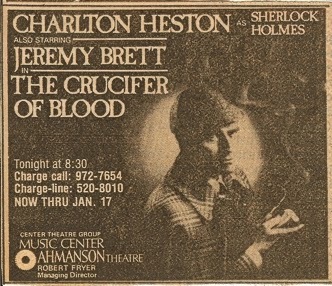 When The Crucifer of Blood played in Los Angeles in 1980-81, it featured Charlton Heston as the great detective. But check out who is second billed as Dr. Watson!